My father was an electrical contractor from the early 1950s through the late 1970s. He hired workers from many labour unions in Sarnia – electricians, pipefitters, labourers, carpenters, millwrights, and operating engineers – to name a few. My father didn’t always agree with the unions’ management, but he instilled in us kids an appreciation of the great strides labour unions accomplished for working men and women. There were, over the years, several places in Sarnia where family members weren’t allowed to shop because they’d been built by non-union labour. “Sirs: We the persons…who represent three gangs which dig…on the Canadian side, being your employees, do hereby request that our wages be raised to twenty-five cents an hour and eight hours a day work. Our reasons for asking for this advance are, first, that our work is under the ground away from the sunlight and natural atmosphere…the effect of these disadvantages we find to be very hard on our physical constitutions breaking down many and making it necessary for all to lay off frequently to rest up and recuperate our health. The note, containing the names of 77 men employed in the highly dangerous and back-breaking work of digging the world’s first submarine tunnel, was signed, “Your obedient servants.” So fearful were the tunnel-diggers of retribution, they signed the petition in a circle around the text, so management couldn’t tell who had signed first. 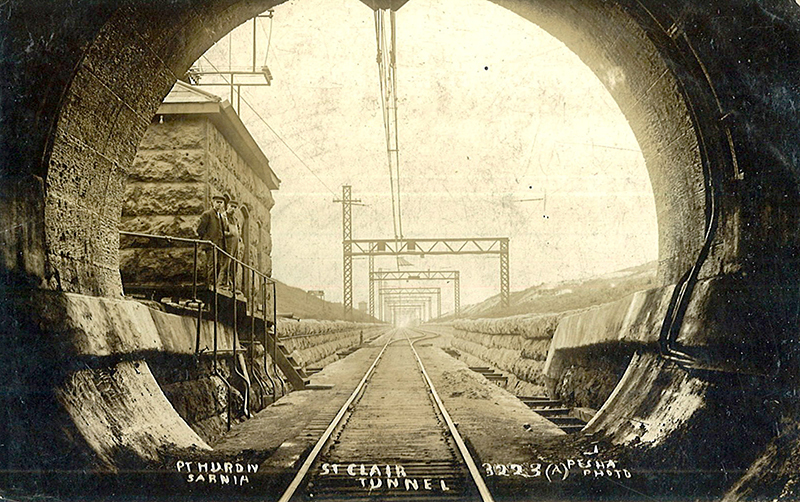 The St. Clair Tunnel management’s response to this plea for relief illustrates the ease of abuse that gave rise to the modern labour movement. The company granted the men their paltry pay raise, but also mandated the workday be jacked to 14 hours from 10 hours. This and other tales of labour history can be found in a fascinating little book by Patricia Drimmie entitled, A History of Labour in Sarnia and Lambton County. Written in the 1970s, the book’s Preface was penned by Des Bradley, the father of Sarnia Mayor Mike Bradley. Known as a champion of working men and women, Des Bradley was, at the time, president of the Sarnia & District Labour Council. For anyone interested in the human side of Sarnia’s past, it is an essential read.